How much to remove a wasp nest from roof? Jump Menu: How much to remove a wasp nest from roof? What do hornets nest look like? When will a wasp nest become dormant? I want to pay a reasonable price! How do I get rid of wasps? For the last five years, we have not increased our prices. This year remains the same. 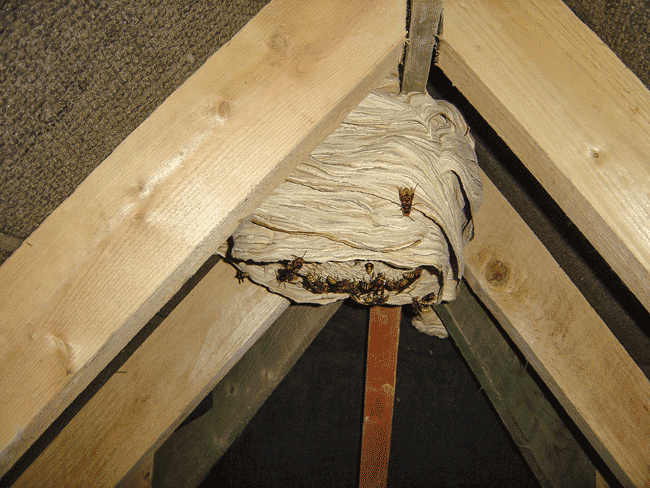 We charge £45.00 to treat any wasp or hornet nest, regardless of the nest location. What do hornets nest look like? A hornet's nest looks almost identical to a wasp nest. The only difference is, a hornet's nest has an open bottom. Take a look at the second photo on our hornet page. That is a hornet's nest. When will a wasp nest become dormant? In winter the only wasps and hornets which are still alive are hibernating queens which emerged from the nest in the autumn. The original queen and all the workers die when their food source runs out at the beginning of winter. It is not cold weather that kills them but diminishing food supply. Once the nest has released queens, the original queen can produce no more eggs, and the nest starts to die as food sources dry up. In a typical year, most nests have expired by the beginning of November when the food supply ends, but nature can be unpredictable, and some nests will last a bit longer. The weather can affect the food supply as well. I want to pay a reasonable price! At £45 we consider this to be a reasonable price to drive to your property and treat a nest. Taking into account; the cost of fuel and insurance, plus our time, our prices are very reasonable. If you consider us too expensive, you do not have to use our services. How do I get rid of wasps? If you have an active wasp or hornet nest, use the postcode search facility on our site to find who covers your area, then phone us.